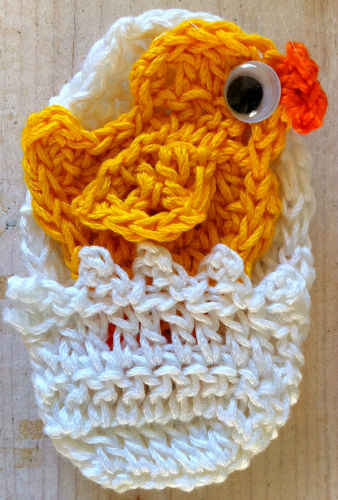 Karen – Using thread for you first project is amazing! Thank you so much for joining the Dishcloth-a-Day Challenge. Your Ladybug is really cute! Materials: Worsted Weight Cotton Yarn: Red – 1 oz, 48 yds (28 g, 43 m) Black – 1 oz, 48 yds (28 g, 43 m) (Peaches & Crème – Red, Black) Yarn Needle. 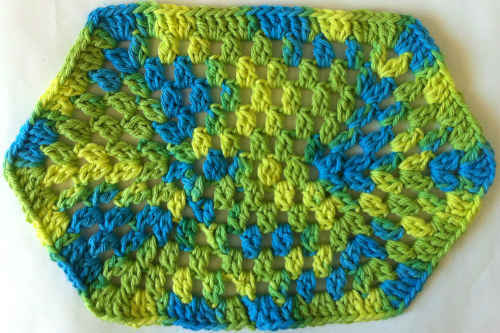 Note: This dishcloth is made in two pieces which are joined together with one center seam. Rows 5-7: Rep Row 4, increasing 1 sc at each end and as needed to keep semi-circle shape and still keep piece flat. Row 8: Ch 1, turn, sc in each st across. Finish off and weave in ends. With right sides facing, place both Body Halves together with straight edges at center to form circle. Join Black with sc to top right of straight edge of right Body Half, evenly sc across right Half to bottom of straight edge. Do not finish off, but attach to bottom of left Half. (Halves are now joined at bottom center.) Rotate work and evenly sc across straight edge of left Half to top. Holding right sides together, rotate work again so right Half is facing you. Working through both thicknesses sl st in back loops only of each sc across. (Halves are now joined to form a circle.) Do not finish off. Open joined halves and with right side facing, sc in each sc around circle; join with sl st to first sc. Sl st to correct placement for antenna. Ch 12, sl st in 3rd ch from hook. Finish off and weave in ends. Join Black in same st and make second antenna. Finish off and weave in ends. – Using needle and Black yarn, cross stitch large Xs on front of dishcloth. 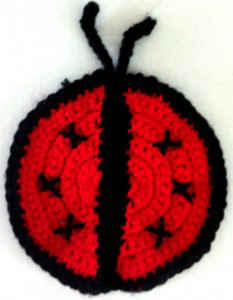 (To keep the back neat, draw needle through stitches at back of work between Xs.